Have the colder days and dwindling rays gotten you down? 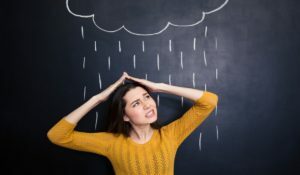 If the answer is yes you are not alone about 6 percent of the U.S. population develops SAD (Seasonal Affective Disorder) annually, and about 15 percent more suffer from a milder version of the winter blues. So as the seasons change its important individuals recognize the signs and work to ease the seasonal slump. While the obvious solution to many people is just stepping into the sunshine, did you know diet can help too? Eat your Omega-3’s. Those same fatty fish listed above contain high doses of omega 3’s to help maintain healthy levels of the brain chemicals dopamine and serotonin. While adding in some mood improving foods beware that SAD can often increase you cravings for carbohydrates. While not all carbohydrates are bad try snacking on the right kinds of carbohydrates to relieve some of the symptoms. Good snacking choices include popcorn, pretzels, shredded wheat squares or low-fat biscotti. When it comes to meals ensure you are getting in those healthier carbs, like lentils, brown rice and whole grains to fight the urge to splurge later on.